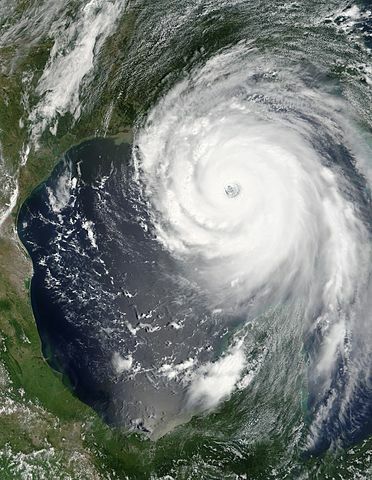 Hurricane Katrina, 2005 – The air pressure, another indicator of hurricane strength, at the center of this Category 5 storm measured 902 millibars, the fourth lowest air pressure on record for an Atlantic storm. The lower the air pressure, the more powerful the storm. from storms in the United States, reports Phys.org. Central pressure deficit refers to the difference in pressure between the center of the storm and outside it. Pressure and wind speed have been used interchangeably to estimate potential damage from hurricanes for years, but the relationship between them has been a long-standing riddle in tropical meteorology. Chavas and his colleagues have defined a theory that solves that riddle. Previous work has observed that central pressure deficit depends on maximum wind speed, storm size, and latitude, but Chavas’ team has determined why that is. Scientists could use this theory to calculate peak wind speed if they had numbers for the other metrics in the equation, which could come in handy because wind speeds need to be measured at several points of a storm, making it difficult to get an accurate reading. The research team tested their theory on two simulations of Earth. The first used the actual distribution of sea surface temperatures and solar radiation since 1979 to produce conditions similar to real historical climate. The second simulation produced a very simplified version of the Earth. It had no land, and ocean temperature and solar radiation were the same everywhere. This made the entire planet sort of like the tropics, meaning hurricanes could pop up anywhere – but they still tended to form at low latitudes and move westward and toward the poles, like they do on Earth. Several lists using different data types. Older hurricanes less accurately measured, or even not measured at all? They touted 2005 as some kind of ‘new normal’ for hurricane seasons, but that idea failed pretty comprehensively. The National Oceanic and Atmospheric Administration said Thursday, Nov. 9, 2017 that a weak La Nina has formed and is expected to stick around for several months. During a period of La Niña, the sea surface temperature across the equatorial Eastern Central Pacific Ocean will be lower than normal by 3 to 5 °C. In the United States, an appearance of La Niña persists for at least five months. It has extensive effects on the weather in North America, even affecting the Atlantic and Pacific hurricane seasons. BOM Australia: All international climate models suggest further cooling of the tropical Pacific is likely, with most models reaching La Niña thresholds in late 2017. Six of eight models suggest that these levels will persist long enough to be considered an event. If La Niña does develop, it is likely to be weak and short-lived. Surely a figure that reflects the central pressure deficit over the area (or volume) of the air mass would be a more useful number for hurricane intensity. If you use the whole air mass it wouldn’t be ‘central’?